Our focus is to get sick people well and to keep them well. We are about restoring balance to your health…naturally. Helping You Achieve Optimal Health! Our Roughan Chiropractic teams in Christchurch and Hokitika, West Coast are dedicated to offering the best in TLC. We provide a thorough spinal analysis and chiropractic health care, integrated health and wellness sessions, specific clinical nutrition consults and quality nutritional supplements in our NaturalMed dispensary. At Roughan Chiropractic, it is our goal to help the people of Christchurch and Hokitika, West Coast achieve optimal health. We want to provide the best of options to you, our community, to help you regain your health, advance your health journey or in promoting the healthy lifestyle you have chosen for you and your loved ones. 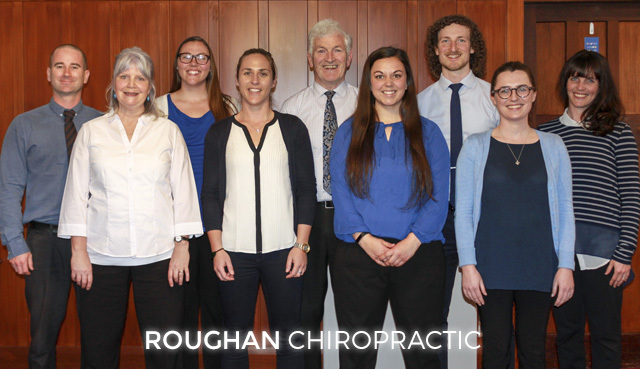 Call Roughan Chiropractic to make an appointment with our Christchurch chiropractors or our Hokitika, West Coast chiropractors and discover what sets us apart! Delivering the best in chiropractic spinal health care, and integrated health and wellness to the Christchurch area since 1981. Now also serving Hokitika, West Coast! Want to learn more about Chiropractic?